Best Whistler wedding photographers Povazan Photography - Best Vancouver wedding photographer Jozef Povazan Photography studio. Best Whistler wedding photographers can honestly say photographing brides and grooms along Sea to sky highway and Whistler is a dream. Scenery, luxury venues and amazing services makes this a sought after place to celebrate your big day. A great photographer captures the story of the day and makes you laugh for years when you see your wedding pictures. The best of the best photographers will take it even step further and creates for you jaw dropping, fabulous freaking awesome images where you would not even expect them. 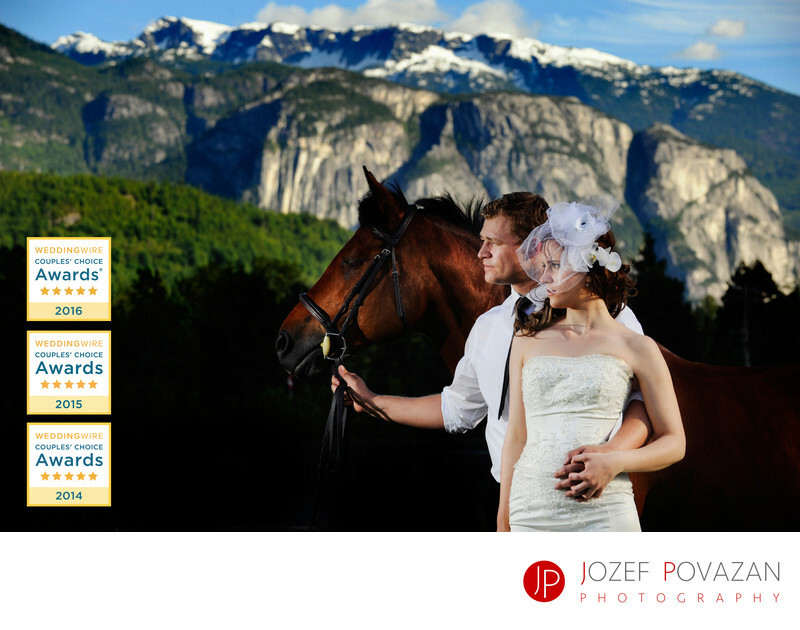 My name is Jozef Povazan - I am North Vancouver based International award winning destination wedding photographer and whistler is close by to my playground. Here is an image from Squamish with Stawamus Chief and the bride, groom and horse in front of it. This images had won a ISPWP Top 20 Award for Povazan Photography. Scenic, creative and modern wedding pictures make your day everlasting in your dreams and memories. No travel charge for any BC wedding destination. Location: Stawamus Chief, Whistler, BC.